I'm not an avid exerciser. That's kind of an understatement, I actually hate exercise. I like swimming, walking around a museum, playing games, but to exercise just for the sake of doing it ~ no. I've never been able to get in the habit of that. I've always struggled with setting aside time to run or walk. It just seems so separate from my world. 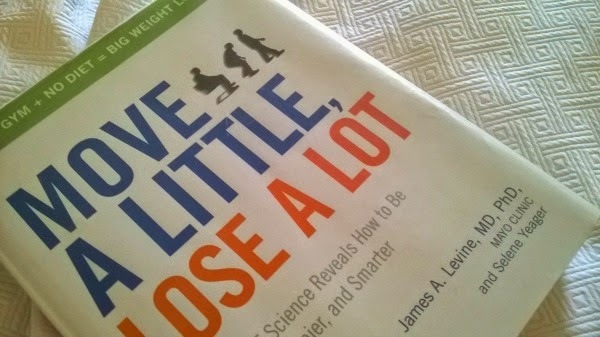 Recently I read the book, Move a Little, Lose a Lot. According to the author, James A. Levine (from the Mayo clinic), you don't need to set aside time to exercise if you increase activity in normal, daily routine. All movements throughout your day help create a healthier life and higher level of energy if done on a consistent, daily basis. The trouble is, that we've become so sedentary we've forgotten how to add movement to our day. Reading this book I realized how much time I spend sitting and with his suggestions I started incorporating movement into my regular routine. I've been doing this for almost a month now and I've seen a huge improvements in my energy level as well as some weight loss and muscle toning. The more active you are, the more energetic you feel. I always thought it was the other way around and tried to conserve energy, but felt so tired all the time. Now I'm more active and have much more energy to do the things I want to do! This is easier than it sounds. I pace around the house while I read a book instead of sitting. I read and research a lot, so this has added tons of movement to my day. It's become so natural I wish I'd always done it! Also, walking while reading activates my brain in a way that helps me process the information and digest it quicker, so it's a win-win. 2. Walk around the house during phone calls. My ringtone has become a signal for me to stand up and walk, not fast, just a slow pace. Talking to my sister, friends or family can often add an hour or more of walking to my day! 3. Stand up while on the computer. 4. Do chores while listening to a podcast. I love listening to podcasts and used to listen to them in the car, but now I save them for chores and yardwork. This helps me keep working for thirty to forty minutes because I don't want to miss out on the podcast! Music works well for this too. 5. Walk while you're waiting. There are so many hours wasted on waiting, why not let them work for your health? I'll admit, it felt a little awkward at first to get up and move while waiting; but once I started, I really enjoyed it. There are so many spare moments to exercise when taking advantage of waiting: walking while kids are in music lessons or sports practice, pacing in the doctor's office or dentist, and walking around the school while waiting for it to let out. These are hidden moments in the day that I used to sit through, but are now vibrantly active. 6. Cook meals at home. I know it may sound minuscule, but every bit matters ~ cutting, chopping, stirring, lifting ~ all of these small movements add up. A side benefit is that cooking at home keeps you from eating fast food and gives you opportunity to make delicious, healthy meals. It's easy to change a daily task from sedentary to active when you know what to look for. There are many tasks you can accomplish while standing or pacing and you'll be amazed at how it helps with muscle tone, weight loss (not fast, but steady) and increased energy. If you're struggling to know where to start, write down everything you do during the day that is sedentary and see if there is a way to make it active. For example, you might walk on the treadmill while watching the news or rock your baby standing up. Try activating just one sedentary task in your daily routine this week, I think you'll love the way you feel! What sitting task would you like to add movement to? Good advice. I find myself being sedentary too, will try to get moving. Good for you, Mood! The difference for me was being able to incorporate it into things I was already doing instead of setting aside extra time. I wish you the best! I was thinking about this just today, because I have been trying to get into the routine of walking on the treadmill. And I hate it. I can stand it when I can prop up my iPad and browse pinterest or something. But even putting on a movie doesn't help as much as you might think. And it's not that I hate activity. I just hate monotony! There must be a better way. I'm going to try these suggestions. I already pace when I pray or fold laundry. Ha.